Last weekend I went to the London Doctor Who Experience. It’s currently at the Olympia convention centre in London. I don’t know the planned length of duration, but these things don’t last forever! I will admit up front that I have not been keeping up with the current Doctor Who shows. I watched the Eccleston season when they rebooted it, but lost interest after that. I may have to re-evaluate that. I grew up watching Doctor Who on Saturday mornings with my dad. I definitely remember seeing Colin Baker and Sylvester McCoy but I’m sure I saw some of the others. Colin Baker is far and away my favourite Doctor. Just dialing it back a little and wrapping up more San Diego Comic Con 2011 blogs here. I guess I didn’t write about attending the SupernaturalÂ roomÂ for the LA Weekly website. By whatever miracle I managed to drag myself out of bed early that Sunday morning and made it in time to theÂ press room at 9:30am. In case you guys didn’t realize this yet– I’m a big ol’ Supernatural fangirl. Not in the scary way (I don’t think) but in the I LOVE THIS SHOW SO F***ING MUCH IT’S THE MOST AMAZING THING EVER IN MY LIFE kind of way. Well. I suppose that could be the ‘scary way’ too. Uh… yeah. Moving on. My point is it was kind of a blessing that I was too exhausted by Sunday to freak out because normal me would have been crying in a corner from nervousness. Which almost happened the last two times we went to the Salute to Supernatural conventions. 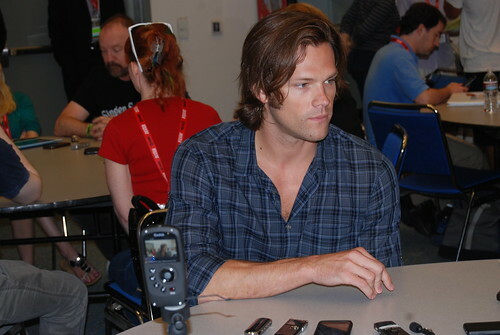 (See Supernatural Vancouver Con and Supernatural in LA, Day 2 posts).